This salad is a classic ! Well done! My mother's favorite salad! We had it constantly when I was a kid. And I know she made a quick version for herself as she got older...just celery, walnuts, apples with mayo on lettuce. I really like your refinements, Grace. A little honey, some zest and cutting the mayo with some yogurt. All the difference in the world. Yum. A delicious speciality! That Waldorf salad looks so good! A terrific classic salad, perfect for the apple season! 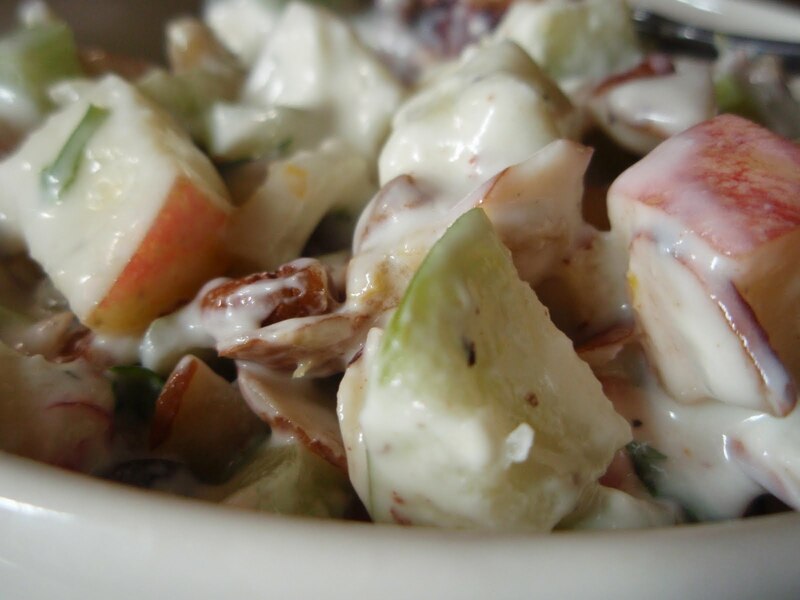 My Mom used to make waldorf salad from time to time, but I've never made. Thanks for reviving a classic! Since I giggled at the sight of the word "goiter," I am obviously also easily amused. Waldorf salad was on our table at every Thanksgiving (sans raisins). Apples, raisins and honey? You can't go wrong! I love that this dressing contains so much yogurt and so very little mayonnaise. I love the Waldorf Salad! My daughter on the other hand doesn't like all the "crunchy stuff"! Love the waldorf salad...but I prefer them with just a little mayo. Although I have to admit I'm not so much a fan of the almighty Waldorf salad, I DO love the name and have been chanting "waldorf" all morning, thanks to you! I've never had the salad, but I do adore crunching the word about in sentences! I love the flavor combinations in a Waldorf salad! Here's another idea: chopped cabbage, apples, nuts, with honey mustard dressing... mmm! Discombobulate! That's always been a winner. 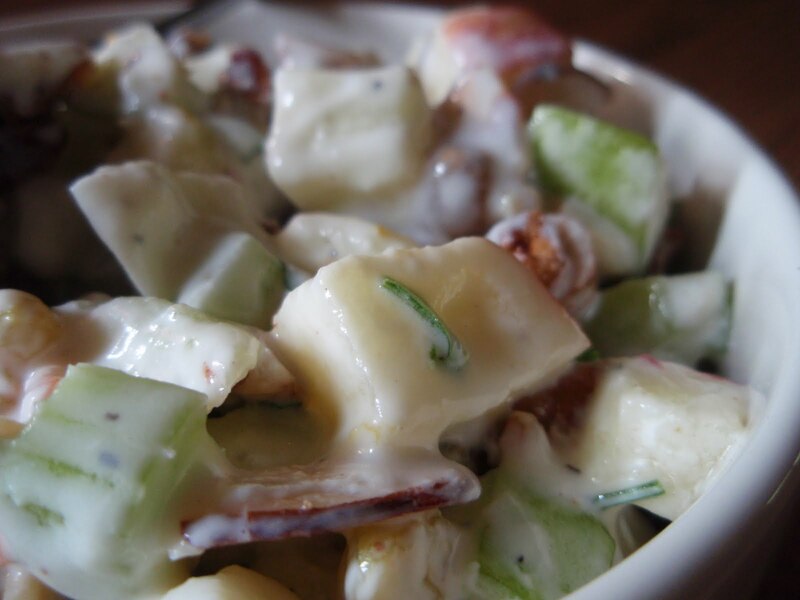 I've never heard of the WalDORF salad, but the combination of ingredients is making me drool! It looks great. Now, if it would stop raining so I could go fetch me some apples from that tree! mmm, yes please. i lurve this salad. i went to the waldorf in nyc and it's all that. trust me. fancy schmancy. I've only had a walDORF salad once and I loved it... thanks for reminding me. Haha, I'm just as easily amused. Happen to love a salad with some sweetness so this looks fantastic. Waldorf....there. I said it LOL. but I've never had it. No reason....just haven't. what a doofus I am! (another funny word.) And what about platipus? that's a weird word. I mean...isn't bad enough that the animal itself looks ridiculous....but did they have to give it THAT name? I've never had waldorf salad before, but I love the sound of walnuts and apples! Yum! haha we must have similar maturity levels because I just laughed my way through saying those words as well! The Waldorf salad is fantastic. A serious classic and for good reason! Delicious! Nice twist on a classic salad. I love your version of this tasty classic Wal Dorf salad! I do as well enjoy a WalDorf salad. nice job. Good words Grace, you should say then with an English accent too! I love Waldorf salad, we generally include a blue cheese too though! Nom nom nom! An oldie but goodie that one never gets tired of eating, especially in summer. I know I have said this before but I am sure you and my Dad would get along so well. He use to ask me to look up in the phone book, names like Al E. Gator... I love Wal Dorf- but don't tell my husband. Grace...So many of the words you mentioned never crossed paths with me...except 'Discombobulate' LOL There was a time where I had adopted this word and drove my familly bonkers!!! I have not thought of a Waldorf salad in so long, wow....what a great salad!! Yours does look delicious. thanks for reminding us all how good that salad is! I have never put nutmeg in this type of salad, sounds awesome! Perfect Fall salad! With all those apples in the fridge Dorf sounds pretty good right now. My mom loves this salad, minus the mayo. I just can't get down with the combo. Is it sweet? Is it savory? Pick one, Waldorf, you're confusing my tastebuds! I don't think I've ever had this salad, but I know I would love it! My mom used to make a great waldorf salad, and I've been craving it lately (well, okay, for the past year). Unfortunately, I'm allergic to most apples when they're not cooked, and to almonds, so a great looking version of the salad, like this one, is off limits. It breaks my heart, because this sounds perfect! Oh. My. Goodness. This looks fabulous and delicious and so healthy! I had to chuckle when you mentioned discombobulate. I'd much rather say that I'm discombobulated (which happens often) instead of saying that I'm just plain confused. I like easily amused. Maybe because I am, too. Put the word "weasel" in any sentence and it automatically becomes funny. Try it. And pass the salad, please. It looks wonderful. I love Waldorf salad and haven't had it years...acually, I've never made it, but a family friend made the best I've ever eaten. Thanks for reminding me of this yummy classic Grace. Warfolf salad is such a classic recipe! Thank you for reminding me of it. I need to make some of this salad! Spring over here in Australia so the perfect time to do it also! Walnuts are awesome! I have never had a Waldorf salad - shock! I am keen to try it. Love all this language talk too - fascinating! Where are you Grace? Is everything OK? wow, I haven't seem a waldorf salad in quite a while, but I do love the combination of sweet and savory and the many refreshing textures... I especially like the idea of adding fresh herbs!